Just the right amount of sweet and salty flavors. 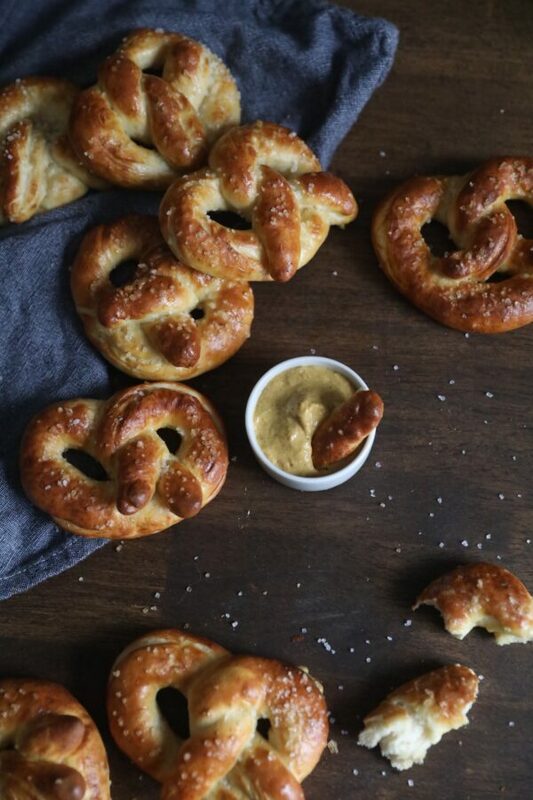 Soft and chewy texture, with that glossy pretzel crust that makes us go crazy and want another. How do I know you will want another? Well, my family ate the whole batch in one sitting, as if it were a meal in itself. Before I had a chance to snap a photo. I think that is proof enough. I have tried a few methods of making pretzels and although they all have their perks, this is the combo I found works best. Start by proofing your yeast. Heat the milk. Either over the stove, or in the microwave. Bring to 105 or a max of 110. Going over that temp will actually kill the yeast. Add the Sugar, salt and butter to the milk. The warm milk will melt the butter, or you can melt it first. Once the yeast mixture starts to become frothy, slowly add it to the flour mixture. Working it into the flour with your hands or a dough hook attachment on your stand mixer. Mix until flour is combined an a dough ball is formed. Cover and set aside. Let the dough rest for two hours. You will notice it has risen or doubled in size. Press the dough down with your fist. Cover and let rest for another two hours. the second time you check on it, it will not have risen as much as the first. Divide the dough as you wish, into small dough balls. I have a culinary scale, so I divided the dough in to 2 oz balls. 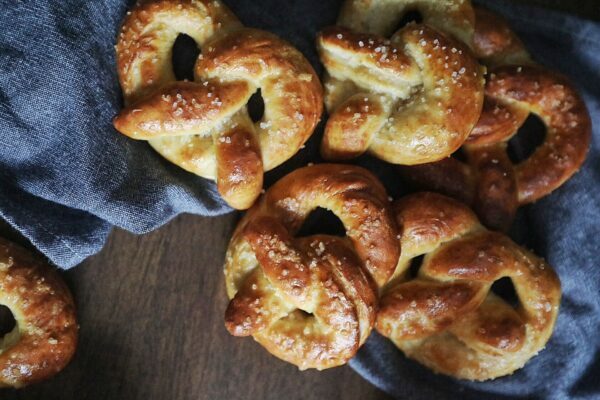 This recipe made 11 pretzels. This will vary based on the size you choose to make. 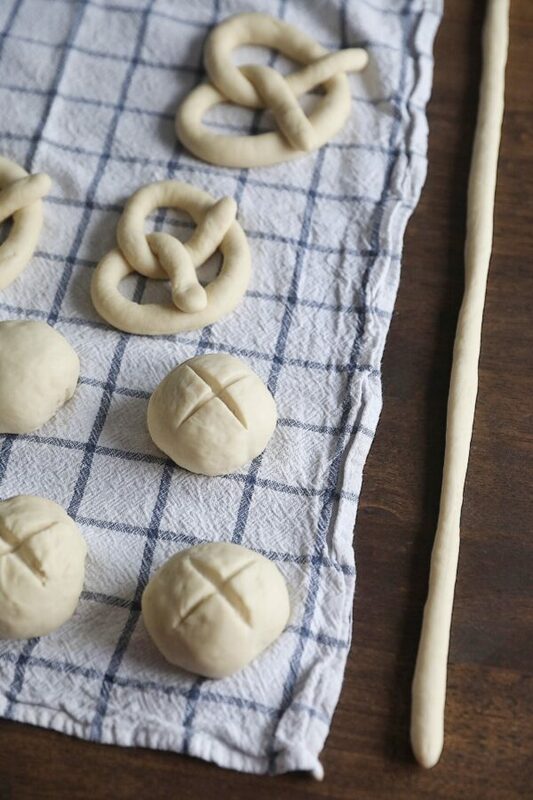 To form the pretzel, roll the dough out like a coil or snake. Try to get it as long and thin an possible. Don’t leave any air bubbles in the coil. It will create problems later. Holding the ends of the coil, the dough will form a large U shape. Rest the bottom of the U or the center of the coil on the table. Cross the two ends and lay them back down over the center of the coil that you had rested on the table, to form the pretzel. 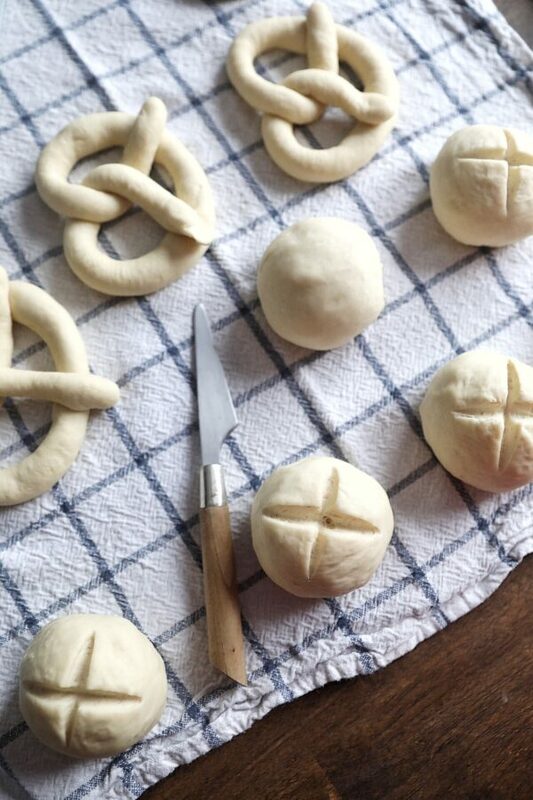 If you find it too difficult to make or form the pretzel, you can also make pretzel buns or bites. Once you have formed your dough, you will bathe them in a baking soda bath. 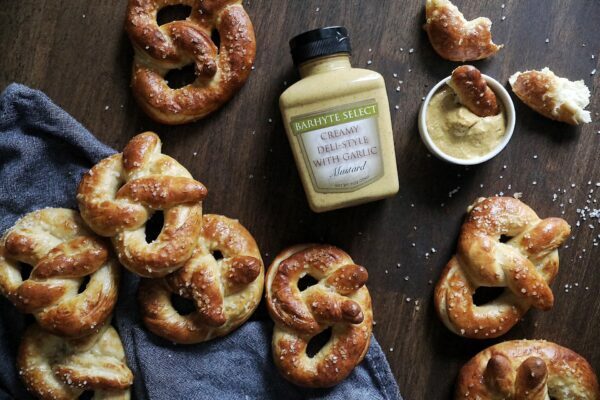 This is what gives pretzels the flavor they are known for. Mix the water and baking soda together. 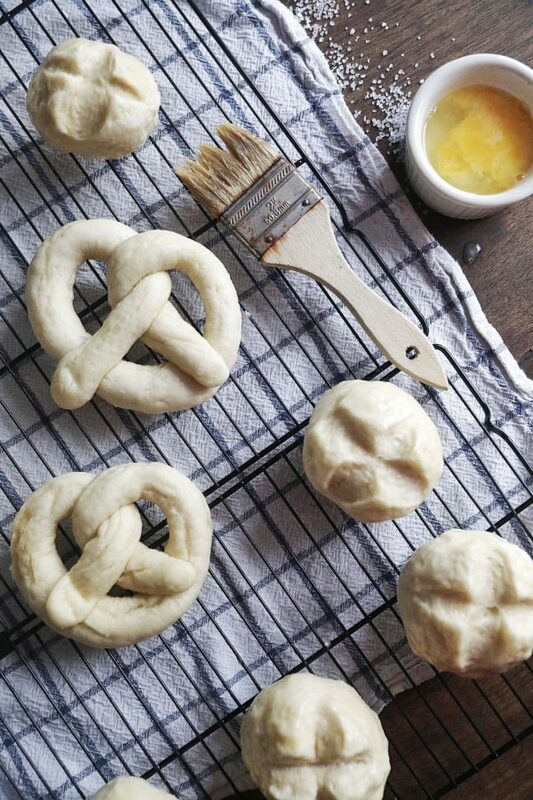 Submerge your pretzel, bun or bites into the baking soda bath and place on a wire rack to drip dry. Once they are dry, brush them with egg whites. If you made a bun, cut an X into the top of the bun to allow it to rise evenly. 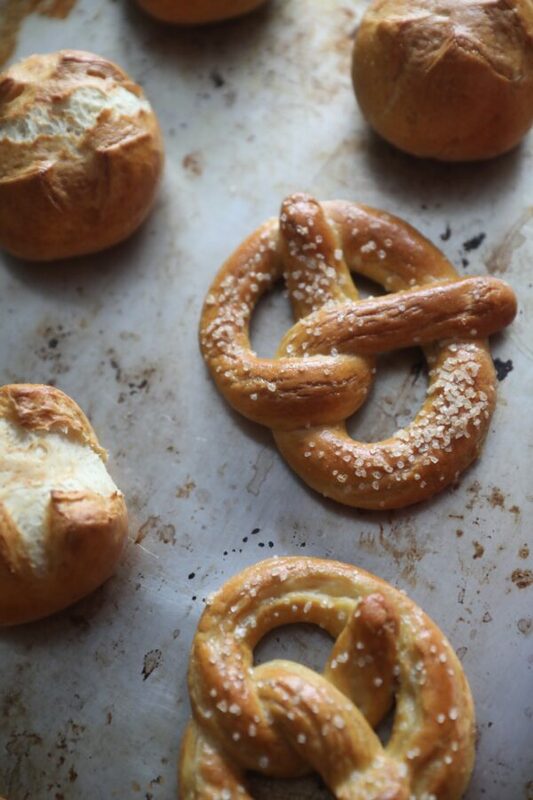 Place the pretzels on parchment paper lined or oiled baking sheet. Let rise for 15 minutes before baking. Heat your oven to 425 degrees before placing the pretzels into the oven to bake. Bake for about 15-20 minutes or until golden brown. Let cool to the touch before eating.